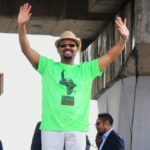 More than 90% of those surveyed by WAAS International, a local research firm, have a favourable view of Mr Abiy, who has released thousands of political prisoners and apologised for police brutality. But a visitor to the capital could be forgiven for thinking the number is even higher. Songs with titles like “He Awakens Us” ring out on the airwaves. Street boys hawk stickers, posters and T-shirts featuring Mr Abiy.